APE 2012: Ticket Stub Debuts and Other Awesome News! Whoa, you guys, this year has really flown by! 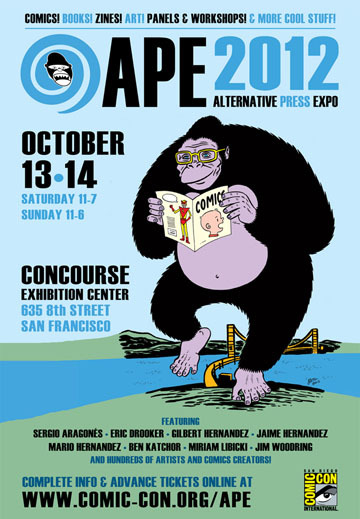 I still have yet to write con reports for the previous shows that I've attended this year, which were amazing, but now another show is starting up: The 2012 Alternative Press Expo (APE) this weekend right across the bay in San Francisco, CA! Woot, woot! Check out that flyer above created by Gilbert Hernandez! As my 3-year old nephew says, "What the?!?" I will be exhibiting at the show for my new publishing project, Yam Books and Lark Pien's Little Bird Books. Lark is currently at the Graphic Novel Residency at the Atlantic Center for the Arts in Florida, but I will represent her as professionally as I can at the show. I will have our Yam Books/Lark Pien collaboration, Lollygag, a sketchbook anthology that Lark edited featuring the compulsive doodles of some of the innovative and exciting cartoonists today such as Dan Zettwoch, Vanessa Davis, Renee French, Dylan Horrocks, and many more. ALSO, I am very glad to announce that the show will mark the west coast debut of Yam Books' first bound book, TICKET STUB! 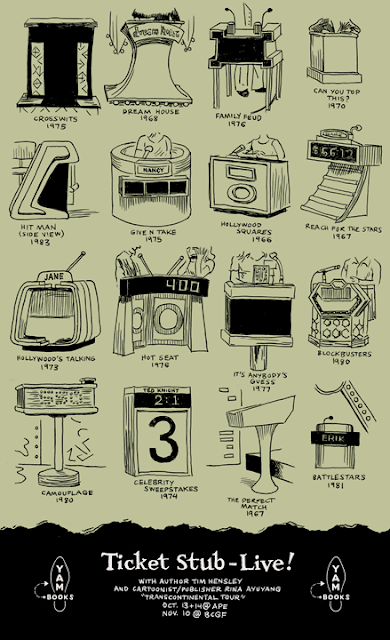 The book collects the beloved mini-comic zine series of the same name by Tim Hensley. Tim will be with me at the show (can you believe that?! ), signing books and talking about captioning work, from the sublime to the profane. We are both very happy and proud about this book and can't wait to share it with you guys. We will also have our own mini-comics and original art as well as the latest titles from Koyama Press such as Michael DeForge's Lose #4, Julia Wertz' The Infinite Wait, Jesse Jacobs' By This Shall You Know Him and many others. We hope you share in the excitement of all of these great books, and visit us at TABLE 306, Little Bird Books + Yam Books. APE is going to be great this year with all the publishers, artists and special guests. What's even more fantastic is that the Cartoon Art Museum will be having their art opening for the Love and Rockets: A 30th Anniversary Celebration exhibit on Saturday night. Special guests Jaime, Gilbert and Mario Hernandez will be there! Oh, MAN!! To get advanced tickets and a limited exhibition print, visit the link below! Do it now! Sunday, 4:45pm Bay Area Comics: Past, Present, and Future—Thien Pham (Level Up, Sumo), Jason Shiga (Meanwhile, Empire State), Andrew Farago (Cartoon Art Museum), and other past and present cartoonists from the Bay Area discuss one of the world's most dynamic and important comics scenes. Whether you're a lifelong San Francisco resident, a new arrival, or just visiting, this panel promises to tell you everything you ever wanted to know about comics by the Bay. Anyway, this weekend is going to be jam-packed with great events and stuff to buy! So see ya there at Table 306!